Ghosting is the ultimate use of the silent treatment, a tactic that has often been viewed by mental health professionals as a form of emotional cruelty.15It essentially renders you powerless and leaves you with no opportunity to ask questions or be provided with information that would help you emotionally process the experience. It silences you and prevents you from expressing your emotions and being heard, which is important for maintaining your self-esteem. Regardless of the ghoster’s intent, ghosting is a passive-aggressiveinterpersonal tactic that can leave psychological bruises and scars. 10. Krossa, E., Bermana, M., Mischelb, W., Edward E. Smith, and Wager, T. 2011. Social rejection shares somatosensory representations with physical pain. Proceedings of the National Academy of Sciences (PNAS), 108 (15), p. 6270–6275, doi: 10.1073/pnas.1102693108. 12. Cynthia L. Pickett, C., Gardner, W., and Knowles, M. 2004. Getting a Cue: The Need to Belong and Enhanced Sensitivity to Social Cues. Personality and Social Psychology Bulletin, 30 (9), p. 1095-1107. 13. Leary, M. R.,Haupt, A. L., Strausser, K. S., & Chokel, J. T. 1998. Calibrating the sociometer: The relationship between interpersonal appraisals and state self-esteem. Journal of Personality and Social Psychology, 74, p.1290-1299. 14. Hsu, D. et al. 2013. Response of the μ-opioid system to social rejection and acceptance. Molecular Psychiatry, 18, p. 1211–1217. 15. Williams, C., Richardson, D. Hammock, G., Janit, S. 2012. Perceptions of physical and psychological aggression in close relationships: A review. Aggression and Violent Behavior, 17, (6), p. 489–494. Have you ever walked away from a conversation where you felt invisible or completely frustrated about not being heard? Have you ever wondered how effective are your communication strategies actually are? Good or effective communication is a skill that can be constantly enhanced as we pass through life. The better we can master this skill the more likely it is that we will feel heard. Our level of communication mastery is never more evident than during confrontations or arguments. These are the times when we become either frozen in our retorts, stammering to get our point across, or worse, become loud and aggressive forcing the other person to become defensive, shut down and cease listening. Good communication helps the individual get more of what they want more of the time. It aids us in stressful conversations by reducing the defensiveness of the other person. It’s contagious, making it a great foundation for negotiation. With this in mind, I have found the following steps to offer a very helpful roadmap through which one can cash in on these benefits. 1. Be brief – Being brief and concise enables everyone to deal with the issue at hand without being distracted by any secondary issues. 2. Be positive – Set the problem in a positive solution oriented frame, noting what you would like to solve. 3. Define the problem – Let everybody involved know exactly what you are taking issue with. 4. Give a feeling statement – “I feel …………..” lets the other person know how the problem is affecting you. 5. Offer and understanding statement – Expressing understanding of the other person’s position, though you may not agree with it, shows the other person that you are willing to see things from their point of view and reduces defensiveness on their part. 6. Accept PARTIAL responsibility – It takes two to tango and acknowledging that you have played a role (even a small one) in the problem shows the other person that you are taking some of the responsibility for the issue. 7. Offer a solution – Again this speaks to the solution orientated nature of this approach. Telling someone that there is a problem without offering some sort of solution is a form of dumping. It dumps the problem on the other individual(s) without showing any buy in on your part. Offering a solution demonstrates to the other person that you are making an effort at resolving the issue. So I would invite those interested to try out this approach. It has application at home with family, in work with colleagues (both junior and senior) and when dealing with troublesome customer care reps. As the approach has a number of parts it may be helpful to type it into your phone or to write it down on a piece of paper for your wallet. This enables you to have it on your person for quick reference when a problem starts to arise. As always, we’d love to hear how you get on with it. How Do You Solve Your Problems??? Define the Problem – As narrowly as possible. Brainstorm all possible solutions – At least 7 solutions. They don’t have to be solutions you want to do. Think of this step as an exercise in lateral thinking. Eliminate the most undesirable options – Leave you top three most desirable options. Explore obstacles – This is often where our problem solving skills fall down. This step is hugely important to keep the solution dynamic and realistic and dramatically reduces the chance of failure. Generate a plan for each obstacle – How can we get around each obstacle. If the obstacles prove to be insurmountable, we will leave this solution and return to step 4 for the next most desirable solution. Evaluate the Outcome – Reviewing the effectiveness of the steps and the solution will further reinforce this skill while also aiding in spotting any gaps that you may have missed. I would generally advise clients to write the above process out when trying to solve an issue as in times of stress people’s heads are already spinning and thus their ability to focus on one issue may be compromised. In addition to this, the above process makes the problem more tangible and manageable if it is written out there on a page. So, give it a try. We’d love to hear how you found it. Came across this interesting blog and thought it may be of interest to some of you. What is ‘fight or flight’? When we perceive a threat, our bodies go into ‘fight or flight’ mode in an instant – this physical response was developed during evolution to help us survive the sabre-toothed tiger, or that troublemaker that was trying to oust us from the tribe, or indeed anything that threatened our survival. You walk over to your lovely bowl of fruit. Reach in, and… ‘OH! a big SPIDER! EEK’. The natural reaction is to jump back – our bodies instantly revving into fight or flight, our hearts thump, our stomachs tighten into a knot etc. But within a few moments, we (well most of us) realise there is no extreme danger here – and our bodies return to a natural balance very quickly. Those are examples of real practical problems that would benefit from fight or flight… after all, if you had to deal with a giant tarantula or a violent intruder, you would make good use of your body in its prepped and revved up state. And in both instances, within a very short time, we realise there has been a mistake in processing the event, and our body returns to balance (homeostasis) quickly. But – many of us fight ‘invisible tigers’ constantly – perceiving dangers and threats and sabre toothed tigers everywhere, which brings on flight or flight even when there is no real danger present. Stress triggers that cause uncomfortable fight or flight symptoms are different for everybody, any number of things can mistakenly appear as a hazard or danger that we feel unable to cope with – general examples? having to give a presentation, attend an interview, go on a date, drive in bad traffic, cope with your noisy children, sort out the bills, busy social occasions, talking to people you’re attracted to, oh… take your pick, you know who you are! 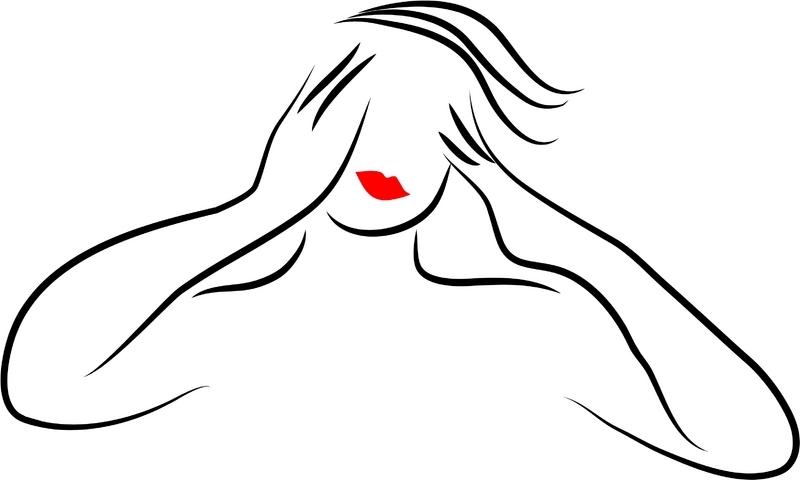 If you have anxiety (or are a ‘worrier), the chances are that you are fearful of many things, with the flight or flight hormones constantly simmering within, which may cause general fatigue, confusion, and ill health – this would also contribute to self-limiting decisions and behaviours, and would of course reinforce a negative view of the world. Fight or flight carries a lot of unhelpful and debilitating effects – recognise any of these? Of course, situations are only a ‘fight or flight’ danger if you perceive them as such – todays danger is often psychological rather than physical. Ideally, we would use CBT to recognise that our thinking causes our ‘upsettness’ and the idea that we are unable to cope – so that we could learn healthy new thinking that would prevent us perceiving hazards where there are none – and so that we could develop new coping skills for a better and more comfortable life experience. 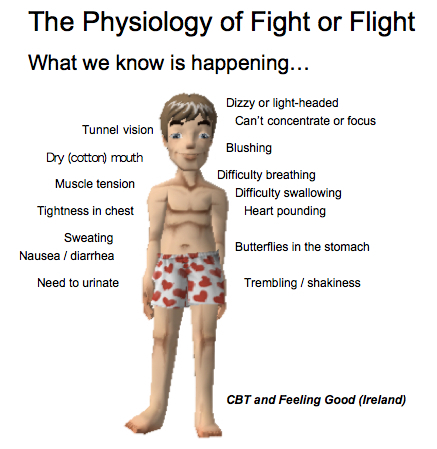 But… for the purpose of this post – let us just look at the physiology of fight or flight here – as it is shown to help people better manage the situation if they understand, scientifically, exactly what is happening and why. Understanding that fight or flight is a natural bodily reaction with a beginning, a middle and an end – and that it is actually a sophisticated elaborate chain developed to help and protect you – can be hugely helpful. This learning and awareness helps us to break down the cycle of fear that can happen otherwise, and can even calm us down – ideally halting the symptoms, or at least decreasing their ferocity and duration – helping us to calm down and ‘right our body balance’ in a shorter time frame. Thoughts racing and disjointed – caused by an adrenaline release. Dizzy / lightheaded –due to adrenaline and increased oxygen levels. Surroundings seem distant or visual ‘tunnel’ –your pupils dilate to allow you to take in as much visual information as possible. Eyes refocus to the distance to spot danger. Heart pounding – The heart starts beating faster to increase circulation, since the body anticipates it will be working harder to service the muscles. Difficulty breathing – the lungs throat and nostrils open up to flood the lungs with enough oxygen to keep up with the increased circulation of blood (re-oxygenating it) – this can trigger shallow rapid breathing. Neck and shoulder tension – caused by oxygen pumping to muscles, or after effects as the oxygen reduces. Blushing – Adrenaline causes your blood vessels to dilate in order to improve blood flow and oxygen delivery. As a result, the veins in your face dilate, allowing more blood to flow through them than usual. Sweating – The body heats up because it is working harder to circulate blood. And then sweats so it can cool itself down / regulate temperatures. Dry Mouth – Cortisol shutting down inessential systems reduces saliva in the mouth. Trembling, wobbliness, tingling and shaking – an effect of adrenaline stimulus and oxygen overload. Summary: what is happening with a person who reacts with anxiety and inappropriate physical symptoms is that their body is reacting to the situation as if were as dangerous as, say, a tiger or lion approaching to tear them apart. A false perception has occurred, triggering a very basic and automatic response. We can learn to challenge our perception of events, and because the fight or flight response occurs only when we perceive danger, it can be avoided or minimized if we can convince ourselves there is nothing to fear. We can challenge and relearn our behaviour and responses to stress triggers by restructuring our thoughts in a more rational and healthy way with CBT – but we also need to be aware of how and why we are physically feeling the way we are – this can help us to stave off panic and remain reasonably calm. Deep breathing: because so many symptoms are caused by the oxygen/rapid breathing physiology – breathing control exercises are hugely helpful in easing them. Medication: if your anxiety is extreme and affecting your life, please go to your doctor and discuss the situation, there is no shame – if you had high blood pressure or diabetes you’d accept it and address it pragmatically, right? treat this in the same way. If necessary, there are several medication options that can relieve your symptoms immediately while you work on your new coping skills (e.g. Betablockers, which suppress the stress hormone involved in the fight-or-flight response. This helps control the physical symptoms of anxiety, or a benzodiazepine/tranquiliser…). Cardio exercise – when you feel your body go into fight or flight jitters, do 5 minutes of physical exercise if possible in the environment you’re in (run up and down stairs, do sit ups…anything cardiovascular, something that makes you sweat!). The body has primed itself for something physically dramatic (the fighting the tiger or running away very quickly..) – and if you stay immobile it will be confused and take longer to return to homeostasis – the exercise will restore balance more quickly. EXTRA NOTE – BEWARE CORTISOL (the stress hormone, or the ‘death hormone’ as it’s scarily called!) – it gets secreted when we are under physical and/or emotional stress. No matter what the source of stress, cortisol is released into the blood stream to help us cope, aiding our fight and flight response by putting sugar into the blood stream so our muscles and brain have the fuel needed to react. Cortisol is generally high in the morning, but should subside by evening when our rest and repair system (parasympathetic system) is supposed to take over and return us to metabolic equilibrium (homeostasis). Or… at least that scenario is the appropriate stress response by the body – BUT, todays lifestyles and challenges mean that more and more of us are in a state of high cortisol most of the time – as our system keeps us in a constant state of ‘readiness’ for the perceived danger/threat of our ‘stressors’. Irritable bowel syndrom – Heart disease – Sleep problems – Digestive problems – Depression – Obesity (particularly depositing fat around our middle section) – Accelerated aging – Memory impairment – Skin problems – susceptibility to illness, etc. Task: create a two column chart, in the first column write out a list of physical symptoms you feel when stressed, and in the second write out the scientific explanation for each one. Study & remember. Some minor edits were made to this post to correct typos, remove some images and add some useful links: additions are in italics. According to a recent report (‘Alcohol’s Harm to Others in Ireland’) by the Irish Health Service Executive (HSE) on the extent of harm caused in society by alcohol entitled “One in four Irish people have experienced problems because of someone else’s drinking”. The report is interesting in that it unusually looks at the ‘other’ and not the one who is drinking. All too often when there is someone in our life who is a heavy drinker or addicted to a substance, or even just someone with a problem be it physical or mental, the focus tends to be dominantly on the ‘sick’ person. The affect the ‘sick’ individual has on others is all too frequently ignored. As the report shows, living, working or socialising with an alcoholic takes it’s toll on many people: people who feel forgotten and unsupported. For those close to the alcoholic their family and social life can be greatly affected and they themselves may be highly anxious, stressed and/or depressed about their situation. Overall, one in ten Irish parents/guardians reported that children experienced at least one or more harms in the past 12 months as a result of someone else’s drinking – verbal abuse, left in unsafe situations, witness to serious violence in the home and physical abuse. The impact of co-workers drinking can affect a worker’s job satisfaction, create tension and the need to cover–up for problems of co-workers who are heavy drinkers, in particularly among young adults. Over one in four people (28%) in the general Irish population reported experiencing at least one or more negative consequences as a result of someone else’s drinking such as family problems, passenger with a drunk driver, physical assaults, property vandalised and money problems. Some people address the toll that someone’s drinking or behaviour is having on them by attending a counsellor. They realise that there is nothing they can do to control or ‘fix’ the other person, that they can only take control of their life in an attempt to change their situation. Short therapies such as Cognitive Behavioural Therapy (CBT) and Brief Solution Focused Therapy can help those suffering from the effects of another’s behaviour and empower them to separate themselves from the stresses, stains and anxiety of being associated with such a person. If you are suffering today or have suffered in the past in the home or workplace from the effects of someone else’s drinking then therapy may help you.